The Gulf Cooperation Council is a military alliance that aspires to be a Middle Eastern NATO, but lately it looks more like a fraternity expelling a chronically misbehaving brother. Since Donald Trump departed Riyadh with a strong message of solidarity and support from most Sunni Muslim countries, the core alliance of the U.S. regional defense strategy has imploded. The Gulf Cooperation Council is now in disarray: Three of six members have cut ties with Qatar and Saudi Arabia has sealed Qatar’s all important land border. Qatar has always been an outlier in the Gulf Cooperation Council and has long been regarded with suspicion by its neighbors. Saudi Arabia and Bahrain both had territorial claims in Qatar, and Qatar subordinated some of its policies to Saudi Arabia as late as the 1970s. But then Qatar began to assert itself. Today, Qatar is closer to Iran (with whom it shares a giant natural gas field) than Saudi Arabia would like. It is closer to the Muslim Brotherhood than the United Arab Emirates would like. It has been accused of supporting al-Qaeda affiliates in Syria. Its hugely influential television channel, Al Jazeera, is regarded as some Gulf rulers as an active national security threat, and by others as merely a persistent vexatious challenger. In response, Qatar’s neighbors have taken action to reign in the upstart. Twice in the last 20 years, ambassadors have been recalled and relations suspended, most recently in 2014. This time might be different, however. There appears to be a deliberate and well-planned effort to get Qatar in line, one which required a great amount of planning and a bit of camouflage. On May 23, the Foundation for the Defense of Democracy hosted a conference in Washington on Qatar’s links with the Muslim Brotherhood. The panelists included blue-chip names such as former Secretary of Defense Robert Gates and former Assistant Secretary of Defense Mary Beth Long. The panelists laid out a long list of grievances against Qatar, such as its support for Hamas, Islamist fighters in Syria, and the Muslim Brotherhood, as well as its willingness to provide refuge for Taliban members. Perhaps the most dramatic moment of the conference was Gates’s comment that the United States should consider relocating its Qatari base (discussed in detail below) elsewhere. Hacked emails of the Emirati ambassador to Washington, revealed the United Arab Emirates had encouraged Gates and reviewed his general remarks before the conference. This level of Emirati involvement was not apparent to those of us at the conference. It is quite possible that the Emirati ambassador, a charming and effective representative of his country, may have been a bit too clever: He possibly crossed the line from talented envoy to perceived string-puller, much like former Saudi Ambassador Prince Bandar (and just about every American ambassador to Pakistan). Later that same day, the Qatar News Agency reported that the Emir of Qatar made a speech at a military graduation calling for rapprochement with Iran and Israel and criticized its neighbors. Qatar immediately claimed its news websites had been hacked and outside observers reported that the emir actually made no remarks at the ceremony. Indeed, it has been reported that hackers linked to Russia were responsible for posting the fraudulent speech on Qatar’s state media website. Regardless of the facts, the message comported with what the United Arab Emirates and Saudi Arabia have long complained about Qatar. Their reaction to the fake speech was swift. Qatari media outlets were blocked. Saudi Arabia, Bahrain, and the United Arab Emirates recalled their ambassadors from Doha. Escalating the stakes, they also suspended air some air travel. Finally, Saudi Arabia announced the closure of the land border with Qatar, cutting the source of a majority of Qatar’s food supply. This is a remarkable action within a free trade area. What Do Qatar’s Neighbors Want? There is quite a bit of speculation, but the aims of the attack appear to be two-fold. First, Qatar’s Gulf Arab neighbors want its independent foreign policy to end. They want to see Qatar in lock-step with Riyadh and Abu Dhabi, just as Bahrain is. Second, the Emirates seem to be pushing for the United States to move its Qatari base to Emirati territory. There is no doubt that this would be an important jewel in Abu Dhabi’s security crown, but would it serve American interests? Advocates of Qatar have always noted the U.S. military’s substantial headquarters and other infrastructure in the country. When the Saudis decided for domestic concerns to push the U.S. Central Command forward headquarters and Air Operations Command Center out of Prince Sultan Air Base in 2003, Qatar welcomed the headquarters to al-Udeid Airbase. Al-Udeid is the largest overseas airbase used by the United States and has two active runways capable of handling every aircraft in the U.S. inventory, together with robust fueling and ammunition storage facilities. In addition, the base also houses the forward headquarters of U.S. Special Operations Central Command (SOCCENT) and U.S. Air Forces Central Command (AFCENT) with their advanced command and control infrastructures. This complex has been built up considerably over 14 years, with much of the funding provided by Qatar. 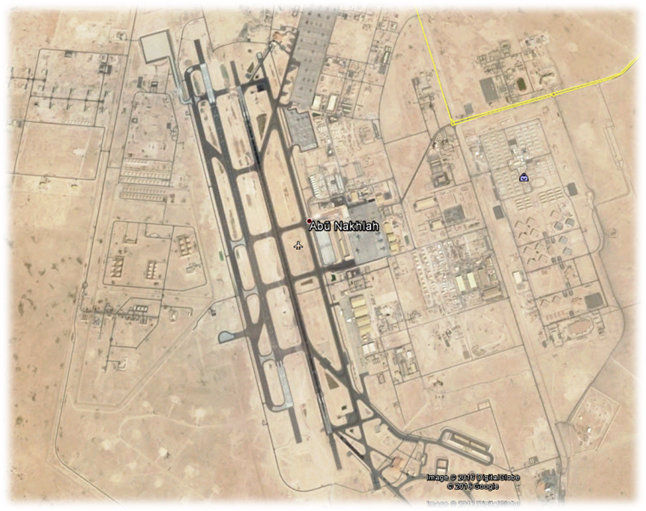 A second military facility, not generally discussed, is also present in Qatar – Camp as Sayliyah. This is a forward positioning logistics facility. It has the equipment for an entire U.S. Army armored brigade, and a number of warehouses. It was essential to American operations in Iraq in 2003. This is not a capacity that can be quickly replicated or moved. Moving such a complex to another country is expensive, and is a matter of more than just money. Some of the infrastructure, such as secure communications facilities, would have to be built by Americans with American money. More important than facilities, however, is the political license granted by the host country to deploy forces from a base. U.S. military bases don’t just act in defense of the host nation. They are used to project power for a variety of American purposes. American bases in Germany (developed and manned for NATO missions) have been used for deployments to Africa entirely unrelated to the NATO mission. U.S. bases in the Gulf have been essential to American operations in Afghanistan, and against ISIL in Syria and Iraq. American planes and ships use the Gulf to refit, rearm, and deploy throughout the Indian Ocean for a range of missions. Consolidating overseas bases in one country risks restricting American freedom of maneuver. Once the United States establishes a base in a country, the host country can restrict or withdraw access if the proposed American action clashes with its foreign policy. For example, in 1973 all the Western European nations except Portugal including NATO members – denied overflight and landing permission to American aircraft resupplying Israel. To consolidate bases in one country is to limit and subordinate American options to the foreign policy of the host country. At the Foundation for Defense of Democracies, Gates noted the importance of political flexibility at Qatar conference. He explained that Qatar was the only country in the region that had a base which could handle the B-52 and was willing to let the U.S. operate the bombers from its soil. As such, Washington would be foolish to limit its options: More bases equal more flexibility. The United States should be expanding the number of its facilities, not contracting them. Washington should exercise the ability to scale its Gulf footprint upward if need be, not limit it for extraneous purposes. America has a number of policy differences with Qatar, but following its other Gulf partners in cracking down on Qatar would actually limit Washington’s ability to mitigate and change Qatari behavior. As long as the United States keeps an active military base in Qatar, it can send political messages by scaling its presence up or down. At the same time America will reap operational and tactical benefits from use of the base. If another country wishes to host American forces, Washington should encourage them and benefit from being the object of competition. But American leaders need to understand that bases do not appear out of nothing, and are easier to close than to open. Qatar’s independent policies derive from its energy wealth, not from the presence of soldiers, sailors, airmen, and marines. American leverage can be expected to increase as energy prices remain low. We don’t have to tolerate bad behavior by Qatar or anyone else – but we shouldn’t deny ourselves a valuable and proven asset in the service of someone else’s political goals. David Des Roches (Twitter @dbdesroches) is Associate Professor at the Near East South Asia Center for Strategic Studies at National Defense University. He has served as the Director for Gulf and Arabian Peninsula Affairs in the Office of the Secretary of Defense, and is an experienced sword dancer. His views are his own. The views expressed here are the author’s and do not represent those of the National Defense University, the Department of Defense, or any part of the U.S. government.